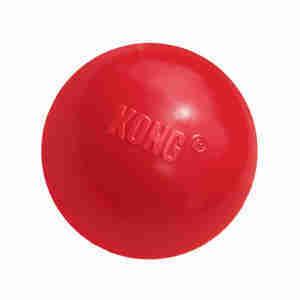 The KONG ball is a classic product with incredible bounce - perfect for games of fetch! Made with the KONG classic rubber, the ball is also a great chew toy for your dog and is made to last! I bought 2 large King balls about a month ago and they are still as GOOD as NEW! These balls have defeated the teeth of my 3 Parson's Jack Russells who have destroyed every other ball on the market within minutes. They love them and get great exercise chasing them and bring them back to me. Tennis balls lasted 5 minutes with one of my dogs. Got this to have a go and 2 weeks later it is still a bouning ball. Heavier than a tennis ball but worth it. Perfect. The small ball is just the size of a tennis ball. It is saving me pounds as my dogs go through tennis balls in minutes.